My trip to the Bay Area Book Festival could have been a bit more organized. Okay, it could have been a lot more organized. I did zero planning before hand and I lagged Sunday morning, showing up at the festival late in the afternoon. The festival hosts oodles of panels and talks, but I visited none since most fill up quickly and I didn’t know what what happening when or where anyway. 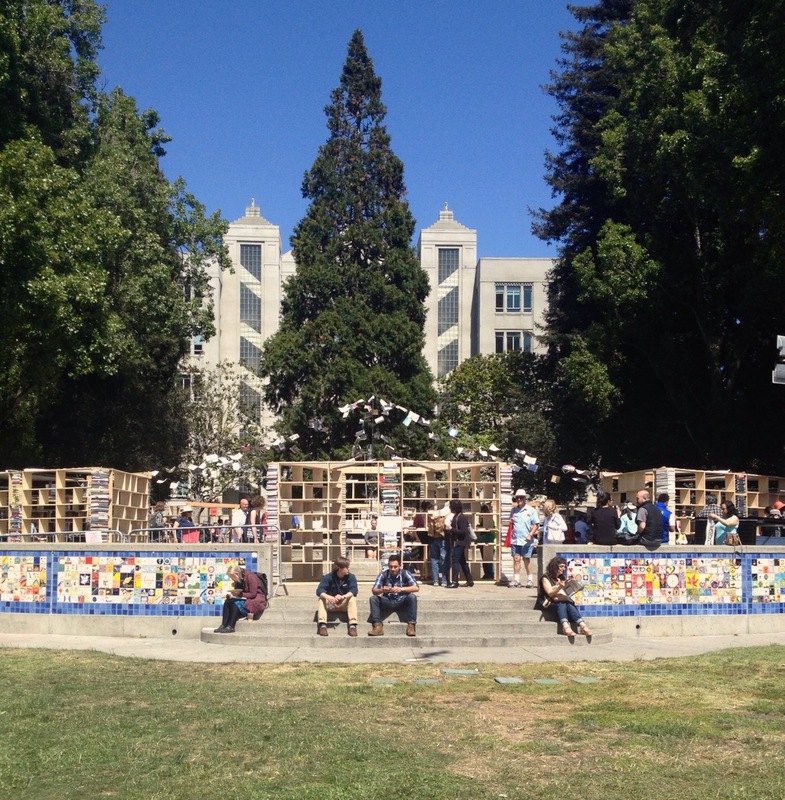 Lacuna is an art installation, which housed shelves of free books. Though, the shelves were looking fairly empty by the time I got there. My lack of planning also meant that I missed a chance to visit the Zoetic Press booth, as they had already packed up shop by the time I got there. So no shiny shot glass or other Zoetic goodies for me. I’ll have to catch them next time. Nevertheless, I had a lovely time, enjoying the sun as I meandered through the booths. 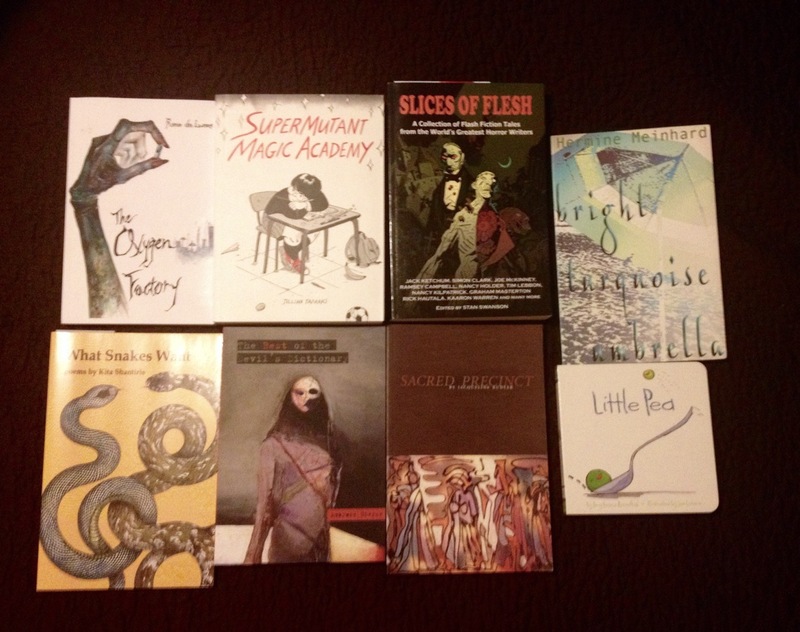 I had a few good conversations with writers and publishers. One of my favorite bits was the Poetry Trading Post at the Small Press Distribution booth, where visitors can sit and write out a poem in exchange for a free book off the display. I put out a spontaneous bit of words, which may appear on the SPD website at some point. In other book haul news. 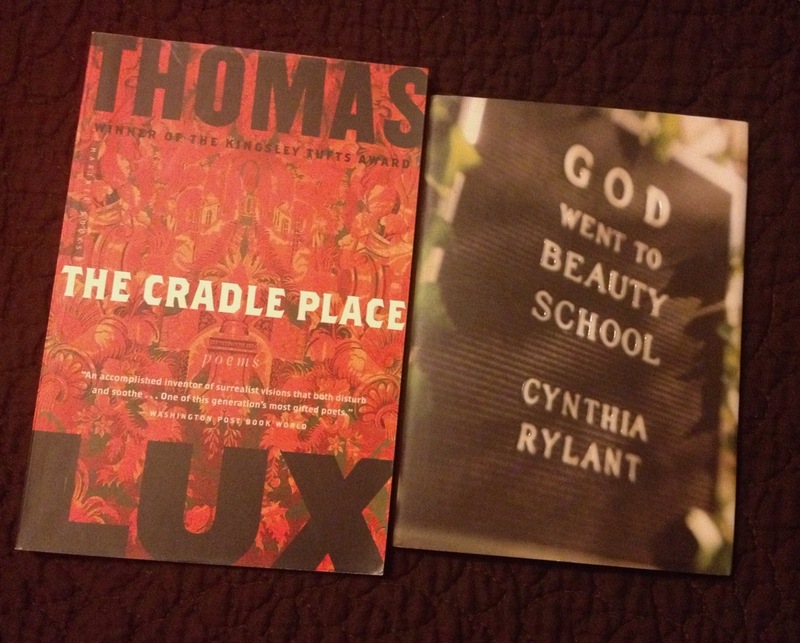 Thanks to the Big Poetry Giveaway, I received two new-to-me poetry books in the mail — God Went to Beauty School by Cynthia Rylant from Lissa Clouser and The Cradle Place by Thomas Lux from Steve Lavigne. Thanks to you both! I eagerly look forward to reading. I’ve started in on Toms River: A Story of Science and Salvation by Dan Fagin. It’s horrifying to see the lengths companies like this would (and do) go to in order to ignore the environmental and health ramifications of dumping chemical waste into the ground, rivers, and ocean so that they can make a profit. This is not a happy read, but it’s fascinating. Some painful attempts to start a new piece happened this week. I kept leaping in to the work only to stumble all over my own self doubts and come up short. The key to these kinds of moments is to just keep putting words on the page — any words, any at all. If one idea slips through your fingers, reach for another. If that crumbles, keep going. Eventually, all this stilted painful writing resulted in something that may actually be editable and so everything was okay in the end. 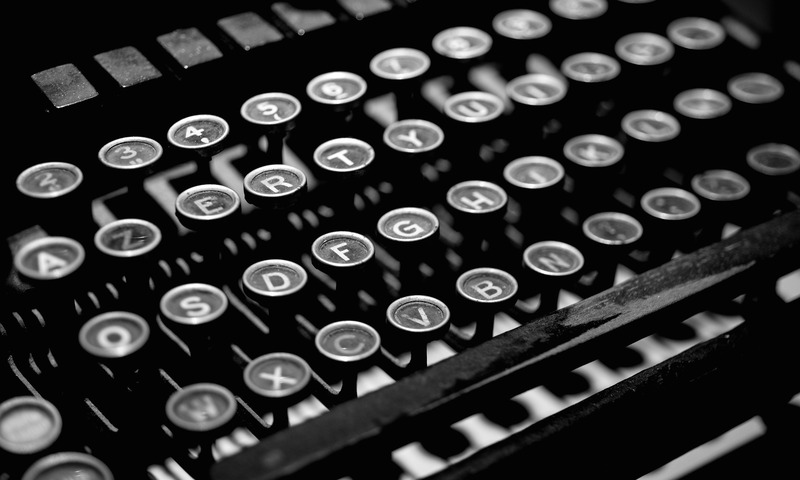 Goal(s) for this week: Write! Edit! Submit! I’m a bit behind at this point and will have to double up next week in order to catch up. This Friday, I’ll be attending (and probably performing) the Glowing with the Moon reading and open mic, held at the School of Arts & Culture @MHP, starting at 6 pm. This event happens every second Friday of the summer months and always has an earthy feel to it. It’s a very loving and supportive space. Jilly Dreadful presents her point of view on loving problematic art over at Rhizomatic Ideas – “All Art is Quite Useless,” or, How I Manage to Enjoy Problematic Work and Problematic Creators in Three Easy Steps – It’s the start of a series of posts that I look forward to closely following. In Heroine’s Journey: Learning to Work, Theodora Goss talks about the importance work plays in female centered tales, especially folk tales, noting “Often, in these fairy tales, it is exactly the heroine’s work that leads to her final reward.” The post is part of a series on the Heroine’s Journey, with the most recent being A Temporary Home.